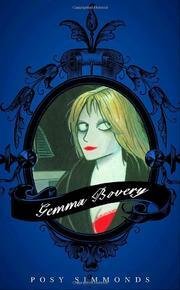 A graphic novel updates a relationship that’s doomed in the manner of Flaubert’s tragic heroine’s. What’s in a name? Well, if you’re an adulterous woman running around the French countryside with the last name Bovery, plenty. Using a different tack than most graphic artists who take on the classics, Simmonds doesn’t make a straight adaptation but instead imagines a modern-day romance with echoes of Flaubert’s masterwork that are noted and fretted over by the narrator. Mainly in flashback after Gemma Bovery’s death, the story is told by Raymond Joubert, a onetime editor who now runs his family’s bakery in a Normandy village and was so obsessed with Gemma after she and her new husband Charlie (both Brits) had moved to the village that he pilfers her diaries and pores over them to unravel clues as to why she died. What emerges is less romantic than sad, almost pathetic. Gemma, a terminally unhappy woman on the rebound, fell into a friendly but unimpassioned relationship with Charlie, divorced with kids, whom she convinced to move to Normandy. Once there, she quickly became bored with easygoing Charlie and sparked up an affair with a young local swell and set in motion the chain of tragedy that led, Rube Goldberg–like, to her death. All the while, the married Joubert watched from afar, riven with lust and jealousy. While Simmonds’s artwork is indeed impressive—her drawings have an almost childlike quality but still smolder with intensity, especially in the depth of Gemma’s eyes—her writing is finely tuned as well, especially in its portrayal of Joubert. An inveterate bore fancying himself an intellectual and aesthete, he tries to disguise his longing for Gemma behind a facade of Gallic superiority. Desperately scurrying about, inserting himself into the drama ostensibly trying to keep reality from mirroring Flaubert’s fiction, he sets those same tragic forces into motion. A moody and energetic variation on an old, old tale that seems brand-new.